It has been a three years since the Wilsonville Wildcats were the Northwest Oregon Conference (NWOC) champions. In 2015 the team went 8-0 in league play, advancing to the quarterfinals. Only two members of the varsity squad from this year's team were on the roster from the 2015 run: Marri McCallum and Jillian Greene. In 2018, the Wildcats again went unbeaten, capping off a 7-0 NWOC run with a win over 2-0 Hillsboro Thursday, Oct. 25. "We started the year out at No. 30 and as of today we're fourth," Wilsonville head coach Dwight Sheppick said. "I expected it all along. The nice thing is their perseverance has been outstanding. As you know we went through a tough preseason, but every one of those preseason 6A teams we lost to is in the playoff right now. All of that paid off today, it paid off. They trusted the system and each other, and we're looking forward. I'm not surprised." The first half of play saw the teams go scoreless, each trying but not succeeding at the other teams' goals. Wilsonville had a number of corner kicks in the first 40 minutes, but was unable to convert. The second half saw that change. 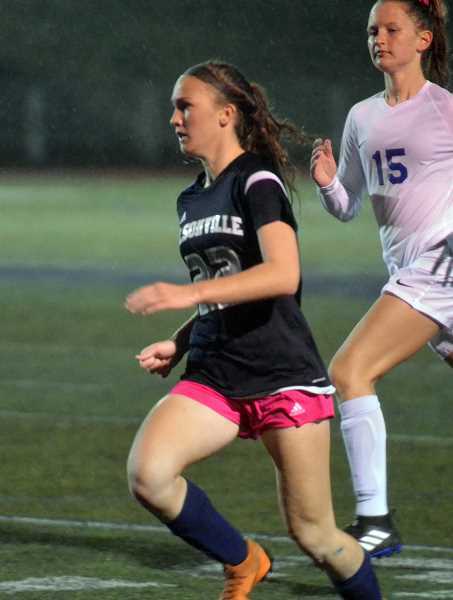 Freshman striker Lindsey Antonson put the Wildcats ahead with a pair of goals in the second, with a header at 28:35 giving the Wildcats the edge over the visiting team. A little more than five minutes later Antonson did it again, this time scoring again with a goal off of a free kick at 23:29. The team rode out the lead, sealing the deal. The win and league championship look even better on paper considering the Wildcats finished league last year with a 3-8-3 overall record. For Sheppick though, the groundwork and players he had last year made the growing pains worth it. "To be honest, last year was a lot of fun," Sheppick said. "They're great kids, it was never about the lack of worth ethic. Having all of those kids back and an infusion of freshmen has brought a breath of fresh air to the team, and they've been focused since day one. They play with more heart than any team I've ever coached, and you can't replace that." In the first round of the playoffs Wilsonville will rematch Crescent Valley (7-4-2) on Halloween night. In the first encounter, the Wildcats walked away with a 5-3 victory. Sheppick expects his team to compete ably in the postseason. "They're ready," Sheppick said. "The heart is there. They expected this. At the beginning of the season a lot of people looked at our schedule and asked us how many games we were going to win, and I said, 'Double digits.' I got laughed at a lot. But we're at nine now, and we just have to win one more to get double digits. We can play anybody in the state."